Has your loved one been diagnosed with Parkinson’s disease? Learning to navigate and understand what this diagnosis means can be overwhelming and stressful for everyone involved. Health changes in aging seniors can be a very emotional time, which is why we have developed our blog, as a resource to those dealing with these difficult changes. Parkinson’s affects an individual’s cognition, motor skills, and mobility, and it can be challenging to know how best to help as the disease progresses. Most people with Parkinson’s disease experience a gradual increase in symptoms over time, which makes the role of the caregiver a continually changing one. Different stages of the disease may require differing aspects of care such as mobility assistance, transportation, home modifications, assistance dressing and eating, and help with recommended exercise. Since Parkinson’s disease affects mobility and balance, your family member will most likely need increasing levels of assistance to remain safe as they engage in daily activities. How Can You Care For Your Loved One With Parkinson’s Disease? Maintain consistency—As Parkinson’s disease progresses, daily activities such as preparing meals, dressing, and walking may become difficult. However, it’s important to encourage your family member to stay involved and participate as much as possible, even if daily activities take longer than they used to. Make changes where necessary—While consistency is important, you may also need to make changes to your loved one’s living environment or daily routine. These may include home adaptations or adaptive utensils and toiletry items that are easier to hold and use. Set realistic goals—Talk with your loved one about about his or her challenges and come up with realistic goals for daily activity. Get help when you need it—Home care agencies can provide additional support as you help your family member adjust to the difficulties of Parkinson’s disease. Don’t be afraid to ask for help and to get input about the best ways to maintain a safe, healthy quality of life. What Are the Benefits of Home Care for Parkinson’s Disease? 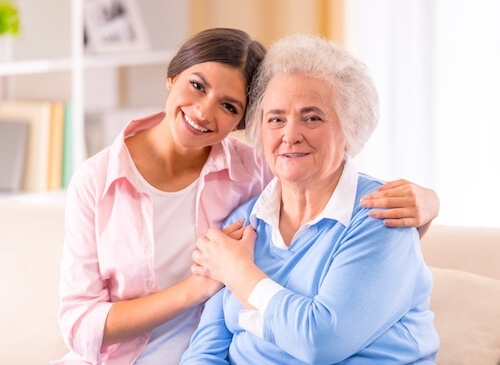 Home care can help your loved one continue to enjoy living at home without risk of falling or being unable to maintain a healthy quality of life. To learn more about how home care can help you and your family face the challenges presented by Parkinson’s disease, download our FREE Guide to Home Care.